The 22 5.0 is the next evolution of the 22 2wd buggy platform. Optimizing the 22 5.0 specifically for carpet and turf tracks, we've been able to narrow the setup window and maximize performance. 22 4.0 nailed the rear end, maximizing adjustment and rear grip for all surfaces, but the Team Losi Racing® development team knew the 22 5.0 could still be improved. Turning focus to the front suspension, we found a way to make the 22 5.0 significantly easier to drive while still giving the car more mid-corning steering. The 22 5.0 takes the 22 Platform to the next level, and will take to you to the top of the podium! The 22 5.0 AC is 100% carpet race ready. It includes an all-new gear diff, front and rear sway bars, narrow front wheels, raised diff inserts and raised axle rear hubs, as well as pistons, springs and molded composites consistent with what racers expect from a race ready carpet off-road buggy. 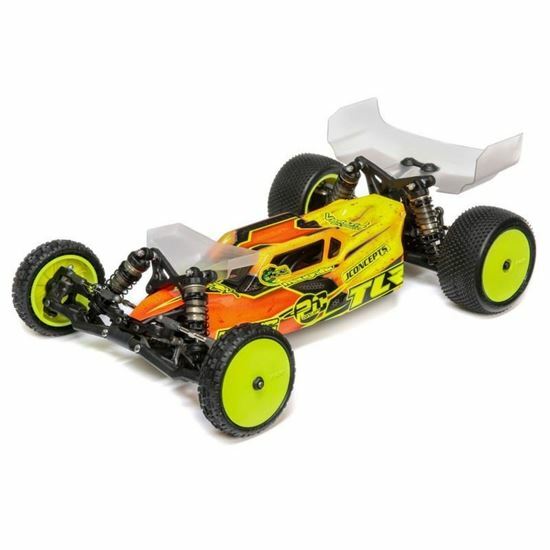 The 22 5.0 is the best driving 2WD buggy Team Losi Racing has ever created and the biggest improvement comes from the steering geometry. Increasing the length of the steering bell cranks and spindle arms, along with changes to the Ackermann angle give the 22 5.0 a significantly smoother steering feel, especially off-center and high speed, while increasing low-speed steering for tighter tracks and 180's. The slipper is optimized with all new slipper plates, slipper pads, spring, spur gears, and an all new top shaft. The new top shaft uses a sturdy M4 lock nut, the new slipper pads allow for spur gears sized 69T to 84T, reduced slipper pad area provides a more linear slip through the throttle application, and thicker slipper plate keep consistent pressure across the surface of the slipper pads. The Gen3 shocks have been completely revamped and improved. The main performance improvement comes from changing to a 3.0mm shock shaft diameter, the 22 5.0 feels "alive" around the track while also landing better with an improved compression/rebound balance. Other improvements include: Screw mounted pistons, new molded shock caps, thinner shock collar which give 3mm more spring adjustment, locking eyelets and spring cups, -3mm, 0mm and 4mm spring cups, new easy to install shock end balls, standard and +2mm length eyelets. The 22 5.0 includes a healthy list of included option parts: Aluminum Ball Stud Washers throughout, Aluminum Clamping Hexes, Aluminum Front Axles, Aluminum Rear Camber Block, Full Machined Shock Internals, TLR Low Frequency Springs, Adjustable Rear Toe Plate and Anti-Squat Block, and Sway Bars for front and rear. Changing from the 2.5mm thick chassis plate, the 22 5.0 has been improved with a 2.0mm thick chassis plate. The thinner chassis provides more flex and grip, making the 22 5.0 easier to drive and less prone to flipping, as well as absorbing bumps and rough landings far better. The all-new traditional style gear differential is more durable and lighter with molded composite gears and cross pins, perfect for mod and spec racing. It also holds more fluid, with larger gear surfaces for a more consistent diff through a run and over several track days. TLR Kits still include a full set of fluorescent yellow wheels to get racers on the track quickly. The 22 5.0 does include the new Stiffezel narrow front wheels which provide more consistent front grip, and more steering in high load turns. Using all metric hardware make it easy to find replacement screws, nuts and washers, and helps to limit the number to tools required in the toolbox. Optimizing the setup for carpet, front and rear sway bars with mounts are included to help control roll and increase stability. The increased consistency will lead to few mistakes and help all racers reduce lap times. The 22 4.0 included diff height adjustments including 0 and +3.5mm settings. The 22 5.0 AC includes +1.75mm +2.5mm, and +3.5mm diff height inserts to optimize bone angle and bone plunge for different grip levels. The 22 5.0 includes the standard Low Roll Center (LRC) front pivot with kick shim in the kit and offers the optional High Roll Center (HRC) front pivot separately. Also included in the kit is a new 1mm thick kick shim which allows for incremental adjustments. Now, racers can run the Super Low Roll Center, Low Roll Center, Medium Roll Center, or High Roll Center, with a 3mm adjustment window. The 22 5.0 boasts the most versatile and easiest to use battery hold down system. The battery cradles key into the mud guards for five fixed, and easy to replicate, battery positions. The battery is then held down with elastomer straps on each end that can stretch to fit any height shorty battery and any weight plates under it. Best of all, the battery is out in no time flat and back in just as easily. The balance and consistency of the 22 5.0 can be tuned using different composite materials in key parts throughout the vehicle. The kit included the parts the race team prefers: Stiffezel front suspension arms, Stiffezel rear suspension arms, soft mud guards, and standard waterfall. Optional brass ballast weights can be mounted under the battery, under the laydown transmission idler, and in the front pivot. This makes it easy to tune the static weight and weight bias for changing track conditions. When running a higher static weight, the chassis will become more neutral and easier to drive on ultra-high-grip surfaces. Pulled from ultra-durable 1.2mm polycarbonate, the TLR 6.5" rear wing isn't new for the 5.0. Instead, this wing has proven itself as the longest lasting and most stable rear wing available for 1/10 2wd buggies over the past few years - and it comes in the kit. The prevalence of spec racing has led to the need for many racers to run motor fans to keep temperatures lower. Rather than an aluminum mount, or double-sided tape, the 22 5.0 includes a molded fan mount secured to the mud guard for easy and dependable fan mounting.